Town Crossings is an experimental performance/mapping project that utilises gameplay as a civic and social strategy of engagement across the physical landscape. Highlighting movement and mobility as an inherent and fundamental actioning of the everyday, the project exposes the transient nature of relationships that generate and form the daily spaces we operate in. In 2015, a series of directed yet meandering cross-town journeys were generated by a play of exchange between one person (the player) and the response invoked by throwing a passer-by (the other players) a Frisbee. A GPS marker on the player records the winding pathways, which accumulate as a series of mappings that make visible the meandering and haphazard nature of the overall trajectories – exposing the dynamics between the intended direction and the actual manifestation of each journey. Understanding that cartography is an attempt to fill geographic spaces with knowledge, in a graphical form that we can communally understand, the exhibited maps reframe the hegemonic values granted to notions of efficient and economic trajectories of human activities across space and time. As a light and flexible model, Town Crossings encourages participation as an open and flexible apparatus. Valuing cultural production through non-economic exchange. where the ability for anyone to participate allows for the constant propulsion of the mediating object, it is a fluid and open process, engaging with a strategy of performative acts as generative sites of social inclusion. Sited in the everyday, Town Crossings can also be seen as an evolving choreography of interpretation, as it produces new engagements via each outing. Activated in the immediacy of the space, and the instantly forming and dissolving of the participatory relationships that occur, the project revalues play and playfulness in our society as a way to collectively produce and rethink new understandings of place. 1 M. Wark, ‘Zuccotti Park, a Psychogeography’, Verso, 2011 <http://www.versobooks.com/blogs/735-mckenzie-wark-zuccotti-park-a-psychogeography>, accessed 27 May 2016. 2 L. Althusseur, Essays on Ideology, Verso, London, 1984, p. 48. 3 M. Warner, ‘Publics and Counterpublics’, in Public Culture, 14 (1), 2002, pp. 49–90. Town Crossings, RMIT Gallery, 2015. Photography: Mark Ashkanasy. Town Crossings, Margaret Lawrence Gallery VCA, 2015. Photography: Kay Abode. Surveying the Occupy Movement’s camp at New York’s Zuccotti Park in 2011, the media theorist McKenzie Wark posed the question: ‘How is it possible to create forms of life for ourselves, even if it’s in the shadow of tall buildings that cast long shadows?’1 Paul Gazzola and Nadia Cusimano’s ongoing project, Town Crossings, responds by suggesting that the spectral vector of the Frisbee offers a counter-practice to the networked, digital, economic and social flows of the city. The work for Performing Mobilities in 2015 tracked the Frisbee players by GPS through the streets of Melbourne as they engaged members of the public in a game. Activating and re-mapping the city as a playground seems like a playful thing to do, but the trajectory of the Frisbee leaves a more serious contrail for us to consider. In stumbling across their project in the city, or in its gallery incarnation (as Frisbee remnants and mapped trajectories across the grid of the city), we bear witness to a form of play that traces a haphazard score written by the player and their assorted partners. The player throws a Frisbee and someone chooses to catch it in the city street – a simple premise that arcs in, around, and against conventional ideological trajectories. These interactions between the thrower and the receiver (the stranger turned partner) are not dictated by the everyday relations we have with time, space, labour, capital and ourselves, but by the humble Frisbee slicing through each of them, in what might be described as a game of call and response. 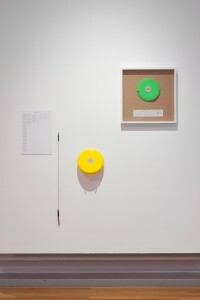 ‘Hey, you there’ is the famous call Louis Althusseur’s policeman uses to hail the subject into ideology.2 Gazzola and Cusimano’s work does the opposite, for the receiver chooses to enter into a field of play, and opt out of the system of accepted discourses and practices that cast our everyday trajectories. It may only be for a short while, but in catching and throwing a Frisbee across public and private spaces, and entering into a conversation about the activity and other things, at the very least, Town Crossings ruptures the individual’s journey from point X to point Y. It says: ‘Hey, you there’ not to rebuke or bring into line, but to offer a counter practice to capitalist consumption and/or our conventional use of public space – most often a place to walk without notice. To some, the Occupy Movement was incoherent in its messaging, but it was clear in what it resisted when it put late capitalism on notice in 2011. The movement proffered what the social theorist Michael Warner suggests is a ‘counterpublic’: a public that does not respond to the call of officialdom or mainstream publics and resists ideological assumptions (and their translation into actions).3 The Occupy Movement signified rebel idleness, and a way to live decoupled from the smooth and easy flow of capital (whether we imagine that as a monetary transaction across geopolitical borders or as the office worker walking to work). The Frisbee is a modest intervention by comparison, but in this project, alongside the mappings of the player’s movements, it signifies idle play, non-economic exchange, collective participation, and, as suggested, resistance to the capitalist rhythms of city. To be sure, this project is a situated counter-practice and not just a game.